Radjay Testosterone E (Testosterone Enanthate) is an injectable steroid that is characterized by high androgenic activity. For this reason, it is best to use a combination of this steroid in combination with steroids, which have high steroid activity thanks to the active substance. As a result of the above-described bunch of two drugs, the maximum effect with the set of high quality muscle pump and a wonderful increase in the indices of physical strength will not take long. Testosterone enanthate is one of the most popular steroids on the market for gaining weight and strength. We love not only bodybuilders, but also powerlifters, as well as popular in triathlon and weightlifting. The main property is a significant increase in the total body weight, largely due to the accumulation of fluid, which leads to a rollback after the course. However, when using the correct course and PKT, the rollback can be minimized. Testosterone enanthate is a drug from the category of anabolic steroids, which is an ester of natural testosterone. Testosterone enanthate is characterized by widespread popularity in the bodybuilding community. The drug is one of the most popular for courses in order to gain weight. Enanthate is a "long" steroid. Don’t waste time. 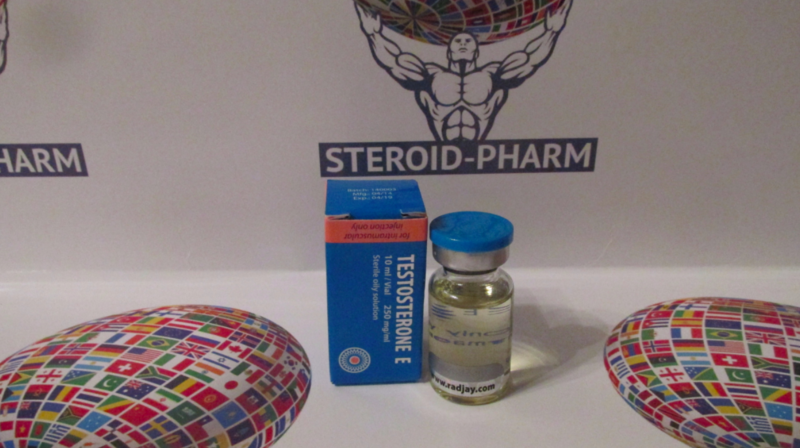 Buy Radjay Testosterone Eonline in our store and get the original product at the bes tprice. The use of Radjay Testosterone E is proportional to the dosage. The choice of dosage for each athlete is individual and depends on many factors. This description will indicate the minimum dosage at which no side effects will occur. Testosterone enanthate can be pierced solo. You can chop with Nandrolone. Classical and one of the most effective will be a course using testosterone-nandrolone-methane. Testosterone enanthate methane in combination should be taken, clearly following the dose. You can start with 250 mg, gradually increasing the dosage. Experienced "chemists" can take up to 1000 mg of the drug, but this is not the limit. The most important thing is to know the measure and act carefully. Radjay Testosterone E is taken in a dosage of 0.25-0.5 grams, as for other long esters of the male hormone. As we said above, you can administer the drug once a week or a maximum of two. More frequent injections will not change the effectiveness of the cycle. It is best to use a combination of this steroid in combination with steroids, which have high anabolic activity of the active substance. As a result of the above-described bunch of two drugs, the maximum effect in the set of high quality muscle mass and a significant increase in the indices of physical strength will not take long. In bodybuilding, triathlon and weightlifting, injections are performed once or twice a week to maintain a consistently high and as stable as possible concentration. 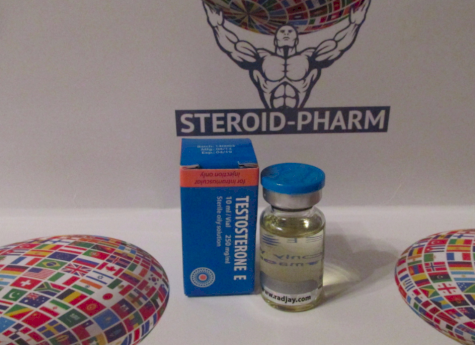 During the use of a steroid, it is necessary to take anti-estrogens, which, incidentally, is typical for all prolonged testosterone-containing drugs. For combined cycles, use this drug in combination with nandrolone, methandienone, trenbolone. Buy Radjay Testosterone E online in our store and start the path to an ideal body right now. Do not increase the dose of medication yourself. This can lead to negative effects. Consult your doctor about the combination of drugs.